One Came Home by Amy Timberlake. Alfred A. Knopf, 2013. New York, NY. And so begins the mystery of Agatha’s death. Or not. 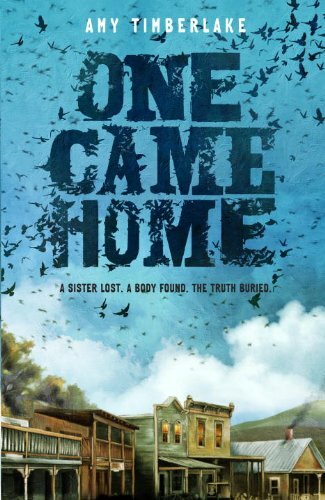 Amy Timberlake’s One Came Home will keep you guessing from the first page to the last. And while reading the story that unfolds, you will be treated to the voice of the protagonist, Georgie, one of the strongest female characters I’ve encountered in middle grade fiction. Georgie is not convinced that the body found in her sister Agatha’s green dress, is indeed her sister. The poor girl was shot in the face and it’s impossible to make a definitive identification in 1871. But Georgie’s mother and grandfather are convinced because the dead girl is wearing the beautiful dress Georgie’s mother made. Besides the page turning mystery, the reader will see, and I dare say, almost smell, what it was like when Wisconsin skies were black with passenger pigeons and folks had a mess to clean up after the flocks passed over their town. Timberlake’s descriptive prose puts the reader in the middle of it all. Georgie’s journey to search for answers to her sister’s disappearance takes many twists and even dangerous turns. When Billy, her sister’s ex-boyfriend, shows up to help, Georgie is at first angry. The fact that he is convinced Agatha is dead exasperates her and leads to many an argument. But this is not a “boy meets girl, boy and girl fight, boy and girl end up together” type of novel. Far from it. For one thing Billy is much too old for Georgie. Secondly, he still has strong feelings for Agatha. Young readers will find in Georgie a strong character with a distinctive voice, that represents a time that might have been simpler, but in many ways, more dangerous. I have this book and love it. The story is very original but Georgie reminds me of the young girl in Rooster Cogborn. Thanks for reviewing such a terrific title.